This can't be a coincidence. Cirò is a small town in Calabria in the province of Crotone, a few miles inland from the Ionian Sea. 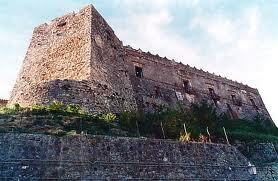 The Carafa Castle (image, right) is one of many such medieval relics of feudal rule in southern Italy. This one was stared in 1496 by count Andrea Carafa and then finished by his grandson with a large wall around the perimeter to protect the site from fierce Saracen invaders then roaming the southern coastal regions of Italy. The castle is said to be one of the largest in Italy and to have housed royalty and other illustrious persons in its long history. Interestingly, the castle has 365 rooms and here's where "This can't be a coincidence" comes in. You don't have to be the inventor of the Gregorian calendar to figure out that 365 probably has something to do with the number of days in a year. You are most wise, bwana-sahibs. As a matter of fact, the inventor of the Gregorian Calendar is, indeed, one of the other illustrious persons to have stayed on the premises. His name was Luigi Lilio, known by his Latin user-name as Aloysius Lilius (c. 1510 – 1576). He was born in Cirò when the castle was not yet completed. He studied medicine in Naples, lectured in Perugia, and had an all-round solid reputation as a doctor, astronomer, and philosopher. There is now a crater on the moon named for him, and there is even such a thing as a Lilian date, the number of days that have passed since the adoption of the Gregorian Calendar (October 15, 1582). I started writing this on LDN (Lilian Day Number) 157261, for example. (I do not know how this converts to Star Date. If you do, please tell me.) In the Calabria region of Italy, they have also declared March 21 (the day of the spring equinox) "Regional Calendar Day" in honor of Lilio. As noted, Lilio is remembered for the Gregorian calendar, the most common calendar in use in the world today, even by cultures that also use other calendars for various civil and religious reasons. The Gregorian calendar was a reform of the Julian calendar in order to bring the date for the celebration of Easter back to the time of the year agreed upon by the First Council of Nicaea in the year 325. Since there are slightly more than the popular version of 365 days in a year, celebrations on fixed days (such as Easter) will "slip" or "drift" through the seasons unless you put in a "leap day" once in a while. Julius Caesar (as in "Julian" Calendar) had the calendar revised once in 46 BC, but after 1500 years, the drift had again become intolerable. Lilius' manuscript was entitled Compendiuem novae rationis restituendi kalendarium (Compendium of the New Plan for the Restitution of the Calendar). The reform of the calendar did not occur until a few years after his death, however, when his brother Antonio presented the manuscript to Pope Gregory XIII. The most dramatic and immediate effect was that it required the calendar to skip eleven days. Thus October 4, 1582 was followed by October 15, 1582. The system was adopted by Catholic countries quickly, with some Protestant and Orthodox countries holding out until as late as 1923 (in Greece). That's the reason we are confused by references to the "October Revolution" of 1917 in Russia. That was late Julian October, but early Gregorian November. (There's a song title in there somewhere!) That's all I will say about calendars because the subject is much too hard for me. (I mean intensely skull-crunching!) I have just pondered weak and weary over the Julian, Gregorian, Armenian, Coptic, Mayan (both long and short versions) and the Thai Solar calendars, and all I have been able to glean is that Christmas and Easter almost never fall on the same day. Back to the 365 rooms. 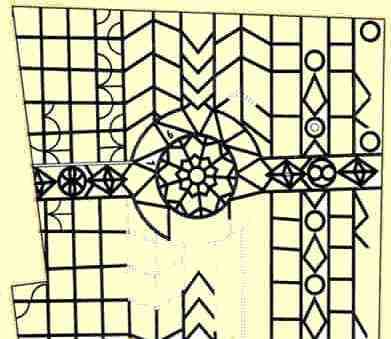 Even before Lilio fixed the calendar, he went to work on his home-town castle in Cirò by engraving in the atrium of the castle an enigmatic design (image, right) taken at various times and by various scholars to be a nine-pointed star, a sun-dial, a wind-rose, a chart of planetary movements, the stone-scribblings Lilius used when he was working out the new calendar, and the illustration for the dust jacket of almost any novel by Dan Brown. It is surrounded by astrological symbols, and every August 30, a ray of light shines through the nearby belfry and strikes the design dead center. There are about 70 medieval castles in Calabria and none of them has something as strange as this. (Although farther north in Puglia, Frederick II's Castel del Monte comes close!) But all this still leaves me wondering why there are 365 rooms. Luigi might have foreseen the confusion and downright anger that were to follow in the wake of the adoption of a calendar that "robbed" people of ten days of their lives! If you believe all the stories (and I don't, but they're good ones, anyway), there were "calendar riots". If I could go back in time, I think I would advise Lilio to rub it in a little bit —sort of a practical joke on the future— and get him to lop eleven rooms off the castle.